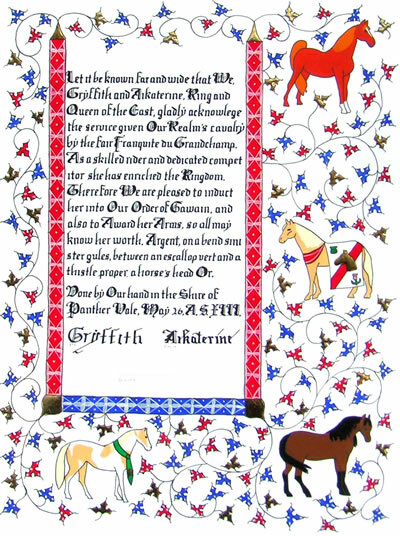 The Order of Gawain (Established by Gryffith and Aikaterine, April 22, A.S. 41) may be awarded by the Crown to honor and recognize those young people, up to and including the age of 17, who have distinguished themselves by acts of valor, honor, chivalry, courtesy, and leadership within a youth martial activity. 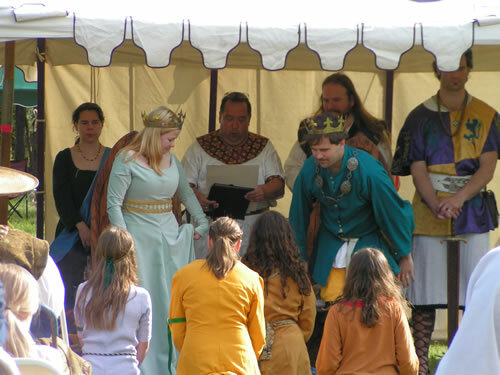 In making their decision, The Crown may, at Their discretion, request comment from the appropriate Marshalate regarding candidates for this award. The recipient of this award is entitled to wear on the left arm a green garter charged with a gold mullet. The Companions of this Order will be bound, insofar as they are able, to maintain and encourage the standards of the Order within the youth martial community. 01/25/2014 Basil Tagaris (aka. Ari Finanson, or Nick of Endewearde).